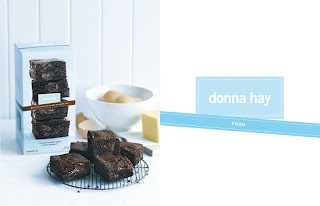 I was given a couple packs of Donna Hay's Gourmet pre mixes of cookies and brownies as a gift. A beautiful gift really and one that anyone would surely enjoy. We finally got around to breaking one of the packets open this week and the kids decided on the Brownie Mix. Super easy (being a packet mix) melt some butter, a couple of eggs and add the mix. Stick it in the oven, bake and enjoy! These brownies are super rich, gooey, but very yummy. They do not however look anything like the image on the box, (I think I cut them whilst they were still too hot) but they all go down the same don't they!! What a lovely gift to receive. Sounds delicious. Looks yummy!! I see C enjoyed helping out too. Loving the curls btw. Hope u saved one for me!!! !